Plus a mysterious demon beast. 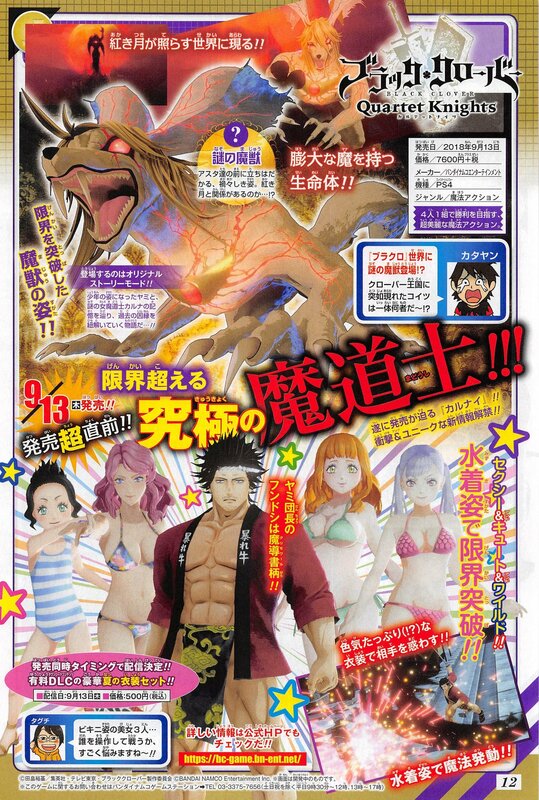 Black Clover: Quartet Knights will have launch day swimsuit set downloadable content that costs 500 yen, the latest issue of Weekly Jump reveals. The magazine shows Charmy, Vanessa, Yami, Mimosa, and Noelle in their summer attire. The original story mode of Black Clover: Quartet Knights traces the memories of young Yami and the mysterious female mage Karna in a story that unravels the fate of the past…. Mysterious Demon Beast – A sinister-looking beast that stands before Asta and the others.It is a life-form that possesses a vast amount of mana. Does it have some sort of connection to the red moon? Black Clover: Quartet Knights is due out for PlayStation 4 on September 13 in Japan, and for PlayStation 4 and PC via Steam on September 14 in the Americas and Europe.